We got UNIQUE with our movement and wellness last week! Last Wednesday February 20th we hosted one of our creative movement workshops at The Unique Space downtown and WHOA…we had a blast! This incredible community, co-working, and event space welcomed our weirdness with open arms. It was a dream to boogie with this slew of fun loving and active folks all looking to shake up their wellness routine and liven up their Wednesday night in this beautiful space. We provided refreshments from Wine and Spirits, Grassfed Coffee, and detox water. These movers were also lucky enough to take home a super UNIQUE wellness bag filled with goodies from brands like life bloom organics, Skinesque, gimme snacks, stryve bitlong, scoutbooks, p.f. candle, and Pointe studio socks. We hit ‘em with some of our favorite exercises like drawing interpretations and the human obstacle course, that got everyone in touch with their bodies, minds, and each other. And as with every Moved LA workshop, a group of strangers left friends. 90s PIZZA, WINE, MOVEMENT PARTY! Bust out the jock Jams and break out the baby tees. The 90s are back and we’re having a themed community workshop with Clever to celebrate. We’ll also have wine, pizza, photo ops and a raffle to benefit the LA United Hill and Woolsey Fire relief fund. Get more details and your ticket here! Less than two weeks away from our workshop at rooftop reds in Brooklyn as part of the Take a sick day for wellness retreat! Grab your tickets HERE to spend the day on the roof with us getting your body, mind, and soul in shape. We're helping you kick off your Memorial Day weekend right! Since it's basically the beginning of summer, it's only right to give yourself a good time while getting in a cleverly disguised workout! Not going to Coachella? Come get your groove on with us instead! Booze, cannabis treats, and YOU get to pick the music! SO excited for our World Party Day workshop today! We've got drinks, treats, and a boat load of fun coming your way cause who doesn't want to celebrate the joy of existing on a Tuesday afternoon?! Our final workshop in the As We Dwell series is at the end of this month! Our group workshop focuses on community building and spending real quality time with friends. Get to know the people around you while you get your groove on! Sign up here and use code WEMOVE5 til March 22 for 20% off! Our second installment of the creative movement workshop series at As We Dwell is our partner based workshop at the end of February. This workshop will help you develop deeper communication with your partner, friend, lover, co-worker, etc. One ticket covers you AND your partner! Moved LA is MEGA excited for 2018 AND our workshop series with Faithful Artisans at As We Dwell! First up is a solo workshop focusing on self exploration and expression. Get to know yourself while you get your groove on! We have two more workshops at As We Dwell in February and March that are partner and group based. Looking forward to getting a little weird and super sweaty with everyone this year! Wow! What a incredible year for Moved LA! LA, NYC, and Connecticut. LA Design Festival, Monarch Workshop, and Pinterest. Coffee, cannabis, and wine. Thank you to everyone who shimmied their hearts out with us this year. We are so excited to announce all the fun stuff happening in 2018! If you're looking for a unique way to celebrate with your friends, Moved LA LOVES hosting private parties for awesome groups of people! It's pure magic so drop us a line! Join Moved LA at ROW dtla next Saturday as we help you design your own moves during the LA Design Festival! Come move with us and check out all the other awesome pop ups and installations at the festival! GAHHHH! 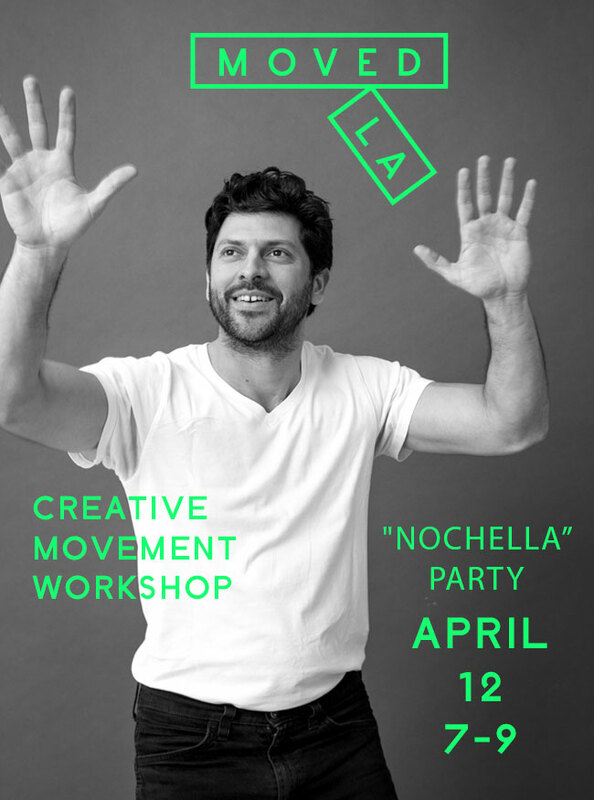 We are so darn excited to be hosting a creative movement workshop at Monarch Workshop this weekend! This heart-centered workshop is designed for women to enjoy themselves, network, learn something new, and discover the means to living a more inspired life. So come move, meet some amazing women, and walk away a more inspired and balanced you! We're back at Rooftop Reds in Brooklyn this weekend! Grab your ticket from the move with us section! Check out this amazing video Hunter & Fox created from one of our workshops! First bit of color on the site here! Please drop us a line if you're interested in any private parties, team building or corporate wellness workshops! Join us on Friday May 5th for a super sweet cinco de mayo party at the Moved LA HQ. We'll have booze for drinking, piñatas for smashing, and ways to get your body movin'! Need we say more???? New Yorkers! Come join us for our second east coast workshop ever! We'll be getting down at the New Women Space in Brooklyn which is an awesome spot to connect with some like minded folks while enjoying a glass of wine and just letting loose! So tell your friends and come move with us NYC!